British artist and writer based in east London, works nationally and internationally. Video, performance, installation, fiction and factual writing. LinkedIn. Twitter. Buy my books. Contact me. 2017: Assembly Bristol. Street Lab at Art Week Exeter/Exeter Phoenix. Salone del Mobile at Milan Design Week. Folkestone Triennal. Melbourne Festival. 2016: b-side Festival, Portland, England. What is Art? A User’s Guide, VASW Southampton City Art Gallery. Milan Design Week, Italy. £ Pro Quo, Sluice___ & Slate Projects, London. Christmas Presence, Dorset, England. 2014: b-side Festival, Portland, England. Outcasting: Fourth Wall, (Cardiff Contemporary), Cardiff, Wales. 2013: Lecture-Performance, MUSAC, León, Spain (continued until mid-2014). Sluice Art Fair, London. 2012: Art on the Underground, Canary Wharf, London. Bridport Festival of Culture, Dorset, England. Sluice, Hanmi Gallery, London. 2011: Beyond the Commission, The Gallery/Arts University College at Bournemouth, England. Highland Park Festival of Music & Emerging Creative Technologies at McGregor Library, Detroit, USA. Sync: Art Meets Technology at Detroit Institute of Arts. 2009 – 2010: Wysing Arts Contemporary: Presents, Wysing Arts Centre, Cambridge, England. Abandon Normal Devices Festival of New Cinema & Digital Culture at FACT, Liverpool, England. The Art of the Overhead, Stapelbäddsparken/Malmö University, Sweden. 2007 – 2008: Dislocate 08, ZAIM, Yokohama, Japan. Broadcast Yourself/AV Festival 08, Hatton Gallery (Newcastle) and Cornerhouse (Manchester), England. Film Circus, Whitechapel Gallery, London. Journeys at Shot by the Sea Moving Image Festival, Hastings, England. OCAT Artists at Borges Libreria Art Foundation, Guangzhou, China. Collaborators: UK Design for Performance 2003-2007, Nottingham Trent University Gallery, England. 2002 – 2006: Hyperlive: Animation and the Camera, Curzon Soho, London. Blink, Gasworks Gallery, London. New Forest Pavilion at 51st Biennale di Venezia/Venice Biennale 2005, Palazzo Zenobio, Italy. Radiator Festival for New Technology Art, Nottingham, England. Microwave International New Media Arts Festival, City Hall, Hong Kong. Edinburgh Film Festival, Scotland. International Symposium on Electronic Art (ISEA) in Nagoya, Japan. Performance, texts, objects, video and interventions for b-side Festival. Remastered version for ESRC genomics conference at Westminster, London. Touring performance lecture, live video and animation. Premiere at Colchester Arts Centre, England, repeated at various other English venues throughout 2010, at Kasseler Dokumentarfilm und Videofest, Kassel, Germany 2010 and at MUSAC, León, Spain in 2013-2014. Large-scale outdoor video installation. Talbot Rice Gallery/University of Edinburgh. Four new video, performance and animation works. Berwick Gymnasium Art Gallery, Berwick-upon-Tweed, England. Psychoacoustic electronics, sound and video works. ArtSway, New Forest, England. Installation, robot and performance works. Oriel Mostyn, Llandudno, Wales. Field recordings and generative sound installation. Changing Room Gallery, Stirling, Scotland. NB: All professional appointments, none paid for by myself. Collusion Lab / Leverhulme Centre for the Future of Intelligence, University of Cambridge, England 2017. KINO KINO Senter for Kunst og Film, Sandnes, Norway 2011. Escalator Visual Arts Retreat at Wysing Arts Centre, Cambridge, England 2009. BCA Gallery, Bedford, England, 2008. OCT Contemporary Art Terminal (OCAT), Shenzhen, China, 2007. University of Edinburgh’s ESRC Genomics Policy and Research Forum, Scotland 2006-2007. Berwick Gymnasium Artist Fellowship, English Heritage/Arts Council England, Northumberland, England, 2004-2005. ArtSway, New Forest, England, 2002. Year of the Artist 2001/Arts Council of Wales at Oriel Mostyn, Llandudno, Wales. Arts Council Scotland/New Media Scotland/Changing Room Gallery, Stirling, Scotland 2000. Writer for The Garden of Remember, augmented reality app for METAL, Netpark and Southend Borough Council, 2016. Writer and product concepts for JCP/CTRLZAK Art & Design Studio, 2015-2017. Interpretation Matters, writing/performance collaboration with arts strategist and writer Dany Louise, 2013-2014. Writing for Garageland and a-n, The Guardian, 2012-2015. Commissioned blogs for Artquest, summer-autumn 2011 and Axis, winter 2011. Three texts for Collider: Photoworks by Thanos Zakopoulos, CTRLZAK Art & Design Studio and huangyangdesign, Greece/China 2011. 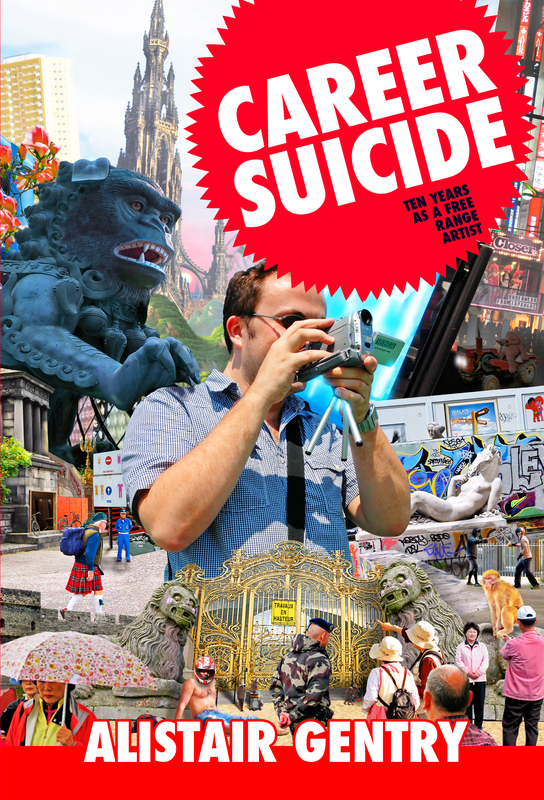 Career Suicide: Ten Years as a Free Range Artist, 2010. The Archive of Imaginary Interiors, in Charlie Murphy: The Anatomy of Desire, text+work and Arts University College Bournemouth 2010. Uncanny Valley: Collected Short Stories, 2008. Three Times True book, 2007, University of Edinburgh/ESRC Genomics Policy and Research Forum, Scotland. Short fiction, reviews and articles in magazines, printed anthologies and online 1996 to present. Founding board member and editor of new fiction website and literature development non-profit Pulp.Net, 2003 to 2009. Novels: Monkey Boys (published 1999), Their Heads Are Anonymous (published 1997, revised second edition 2005). New novel in progress. Stage and radio plays (1997-2002) for Soho Theatre Company, Cottesloe/National Theatre, The Wolsey Theatre, LBC and BBC radio. Young Radio Playwright of the Year award winner for The Unclear Age. What They Didn’t Teach You in Art School, Octopus, 2016. Conferencia Performativa, This Side Up, 2015. Market Project, (by Market Project collective) 2012. Nature After The Genome, Blackwell, 2010. Darwin in Scotland: Edinburgh, Evolution and Enlightenment, Whittles Publishing, 2010. The Video Vortex Reader, Institute of Network Cultures, 2008. The Berwick Gymnasium Fellowships: An Archival Record, English Heritage/Art Editions North, 2008. Collaborators: UK Design for Performance 2003-2007, Society of British Theatre Designers, 2007. The Animate! Book: Rethinking Animation, Lux, 2006. Repetitive Beat Generation, Rebel Inc, 2000. Venice Agendas, Folkestone 2017. Melbourne Festival, Derbyshire 2017. Sluice__, London 2016. LeithLate16 Festival, Scotland 2016. b-side Multimedia Arts Festival, Portland, 2014 and 2016. The Helmsdale Helm, Caithness, Scotland, 2016. Schei$e Kunst Klub, London, 2013-2014. Magickal Realism, MUSAC, León, Spain, 2013. Zombies: Eating, Walking and Performance, University of Plymouth, 2013. Accounts, Artquest/Resonance FM, 2012. Supernormal Art & Music Festival, Braziers Park, Oxfordshire, England, 2012. Instituted by Artists, Artquest/Contemporary Art Society/DACS, Conway Hall, London, 2012. Art and Money, Site Festival 2012, Stroud. Stendhal Syndrome (live), Milton Keynes Gallery, 2012. Market Project: Too Many Artists, Firstsite, Colchester 2011. Sluice Art Fair, London 2011. Abyssinian Gold (live) at Deception, Disguise and the Dressing Up Box, London 2011. Speaker and ‘Too Many Artists’ workshop at ArtSway Associates: Beyond the Commission Symposium, Arts University College at Bournemouth 2011. In Pursuit of the Real, Fabrica, Brighton 2010. Magickal Realism premiere at Colchester Arts Centre and touring England and Germany, 2010. John Dee Actions at Art of the Overhead, Malmö, Sweden, 2009. 狐夜Kitsune Yoru [Fox Night] (urban exploration/alternate reality role playing game) at Dislocate 08, Yokohama, Japan, 2008. Genomics Network/National Science Week art+science workshops for school children and students at University of Exeter, 2007; Glasgow Science Centre and Baltic Centre for Contemporary Arts, 2008. The Upgrade: Scotland at Centre for Contemporary Art, Glasgow, Scotland 2007. Host of monthly Slash Salons for scientists, students and artists at the University of Edinburgh, 2006-2007. VARIE (Visual Arts Research Institute Edinburgh) Image and Trust? Seminar Series, Scotland, 2006. Artists’ Seminar Series, Baltic Centre for Contemporary Arts, Gateshead, England, 2005. UK reading tours, 1997-1999. Stendhal Syndrome and Abyssinian Gold [Vexations, After Horace de Vere Cole] performance works for HD video made at KINO KINO Senter for Kunst og Film, Sandnes, Norway, 2011. LPT BNB GDD LGN JPN, video installation, commission for Shot by the Sea Moving Image Festival, Hastings, England, 2008. 视频具有民族特色/Video with National Characteristics, single channel video/multi-screen installation, OCAT, China, 2007. Three Times True, large-scale outdoor video triptych installation, GPRF/University of Edinburgh/Talbot Rice Gallery, 2007. Ideograph, digital animation/video projection for ESRC Genomics Network Conference, Westminster, London, 2007. 青島五十八中/Qingdao 58 Middle, Solent Centre for Architecture and Design/Creative Partnerships, 2006. Nowhere Plains at Radiator Festival for New Technology Art, 2005. Performance lectures via live internet stream. Revised/restaged 2008 for AV Festival in Newcastle. Sea House, 56th Aldeburgh Festival, Suffolk, England, 2003 and at Labculture Symposium, Bridport, England 2003. Hypnomart, collaboration with Joe Magee, Channel 4 Television and Arts Council England (Animate! ), 2001. British Animation Awards 2002 finalist. Magazines: a-n, Art Monthly, The Art Newspaper, The Big Issue, Dazed & Confused, The Face, Flux, Frieze, Garageland, i-d (UK), IDN (Japan/Hong Kong/Singapore), Mac Format, MAP, Realtime (Australia), SFX, Sluice, Vertigo, Video Vortex Reader (NL), Wired. Newspapers: China Daily, The Evening Standard (UK), The Guardian, The Independent, The Independent on Sunday, Metro, Scotland on Sunday, The Times (UK). Native speaker of English (C2*). Other languages: German (B2*), French (B1*), Japanese (A2*), Mandarin Chinese (A1*). *Common European Framework of Reference (CEF) level. Adaptable, resourceful and self-reliant in varied environments and cultures, having worked successfully in the UK, the USA, mainland Europe from northern Scandinavia to southern Greece, China (Beijing, Qingdao, Shenzhen, Hong Kong) and Japan. Experienced public speaker and performer, with over twenty years of experience. Articulate, confident and constructive contributor to discussion and problem-solving. Workshop planning and delivery in creative subjects, including work with children, people of all ages with special educational needs, and people who speak English as a second language. Extensive experience of collaboration with other professionals including policy makers and leading researchers in the arts, in life sciences and in the social sciences, and in institutional contexts such as universities or public art galleries. Numerous successful presentations at scientific and arts conferences. Experience of teaching in the UK, Norway, Japan and China, in the subjects of art, filmmaking, creative writing and critical writing for the visual arts at higher education, graduate and postgraduate levels. Mentoring, formal or informal portfolio sessions and crits for graduates and postgraduate artists. Selection and judging panel experience for group exhibitions, art and literature commissions. Camera operator and sound recordist with consumer, prosumer and professional equipment including production for HD. BBC trained radio producer. Sound, offline-online video editor and colour grading to HD broadcast standards. 3D modelling, 3D scanning and fabrication using digital sewing machines, CNC routers/devices, 3D printers and laser cutters. Final Cut Pro/Studio, Motion, Color, Premiere, Photoshop CS, Reason, Modul8. Open source creative software. 3D modelling. Internet research. WordPress blogs and server installations. Online content management systems. Site design, implementation and maintenance. Professional, published author of fiction, critical writing and plays for radio and stage. Successful blogger and self-publisher with substantial readership. Artist and filmmaker, showing work in galleries throughout the UK and the world. Commissioning editor of fiction, and copy editor. Producer of independent and commissioned arts projects, of public arts events and discussions, and of documentary and animation for BBC radio and Channel 4 television. Writer of scripted drama and experience of devising for performance. Full UK government clearance to work unsupervised with children or vulnerable adults. £5,000,000 (€5.600.000/$8,700,000) worldwide public liability insurance.